American symphony orchestra based at the Kimmel Center for the Performing Arts in Philadelphia, Pennsylvania. It is one of the "Big Five" US orchestras. For chorus credit use The Philadelphia Orchestra Chorus. 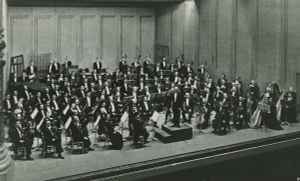 The orchestra was founded in 1900 by Fritz Scheel, who also acted as its first conductor. In 1907, Karl Pohlig became music director and served until the orchestra cancelled his contract. Leopold Stokowski became music director in 1912 and brought the orchestra to national prominence. Under his guidance, the orchestra gained a reputation for virtuosity, and developed what is known as the "Philadelphia Sound." In 1917 Stokowski lead the Orchestra in its first sound recording for the Victor Talking Machine Co. Philadelphia became the first orchestra to make an electrical recording in April 1925, with Saint-Saëns' Danse Macabre. Later, in 1926, Victor began recording the Orchestra at The Academy of Music (the home of the Philadelphia Orchestra until 2001). Stokowski led the ensemble in experimental long-playing, high-fidelity, and even stereophonic sessions in the early 1930s for RCA Victor and Bell Laboratories (Bell Labs, Murray Hill, NJ). Stowowski and the orchestra recorded the soundtrack for Walt Disney's Fantasia in multi-track stereophonic sound in 1939-40. Stokowski left the orchestra in 1941, and did not return as a guest conductor for nearly 20 years. In 1936 Eugene Ormandy was appointed co-conductor with Stokowski and was given the title of music director two years later in 1938. He remained as music director until 1980, after which he became Conductor Laureate. Ormandy conducted many of the orchestra's best-known recordings, remaining with RCA Victor through 1942. Following a settlement of a recording ban imposed by the American Federation of Musicians, the Orchestra joined Columbia Records (Columbia Masterworks) in 1944. The orchestra returned to RCA Victor in 1968 and made its first digital recording, Bartók's Concerto for Orchestra, for RCA in 1979. The Orchestra has also recorded for EMI and TELDEC. Ormandy took the orchestra on its historic 1973 tour of the People's Republic of China, where it was the first Western orchestra to visit that country in many decades. Upon the retirement of Eugene Ormandy, Riccardo Muti became the fifth music director of The Philadelphia Orchestra. Muti's recordings with the orchestra included the symphonies of Beethoven, Brahms, and Scriabin, for the EMI and Philips labels. Wolfgang Sawallisch succeeded Muti as Music Director from 1993 to 2003, and he was named Conductor Laureate, and held the title until his death in 2013. Sawallisch made a number of recordings with the orchestra for EMI, however, the orchestra lost its recording contract with EMI during this time, which led to a musicians' strike in 1996. In January 2001, Christoph Eschenbach was announced as the Orchestra’s seventh music director; his tenure began with the 2003–04 season. In December 2001, The Philadelphia Orchestra performed inaugural concerts in its new home at The Kimmel Center. In May 2005, the Orchestra announced a three-year recording partnership with the Finnish label Ondine, the Orchestra's first recording contract in 10 years. In October 2006, Eschenbach and the orchestra announced the conclusion of his tenure as music director in 2008, and Charles Dutoit began a four-year tenure as chief conductor of The Philadelphia Orchestra. In June 2010, Yannick Nézet-Séguin was appointed Music Director Designate, and in 2012, he was appointed music director, succeeding Dutoit, who subsequently was named conductor laureate of the orchestra.